SOUTHBRIDGE — The Gateway Players Theater kicked off its 44th season with a show filled with love, mystery and laughter. A real nail biter that had everyone guessing all the way up until the end as to whether the butler is guilty in this murder mystery. 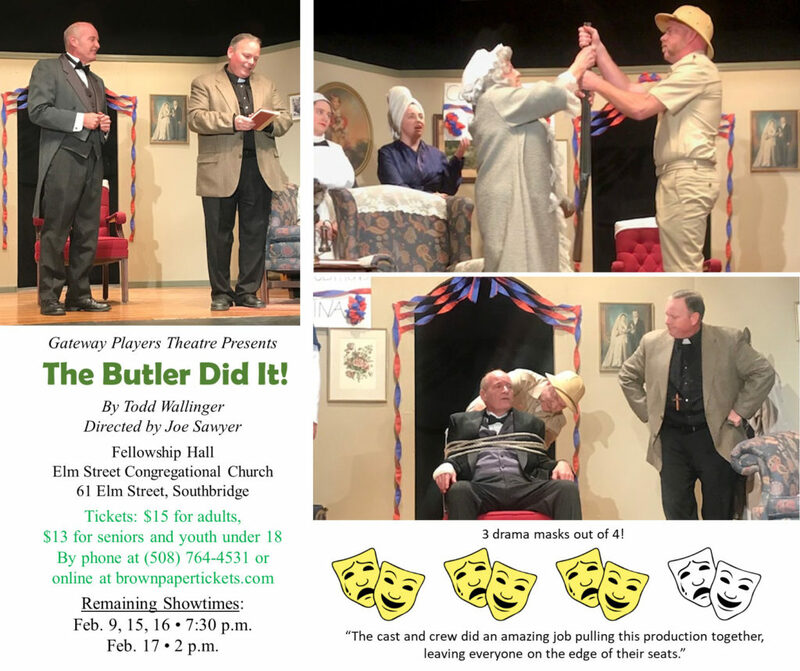 Their rendition of The Butler Did It!, written by Todd Wallinger, filled the Fellowship Hall at the Elm Street Congregational Church, 61 Elm Street, where it is playing through February 17. The show takes place in the early 20th century at Covington Manor, located in England. The level-headed butler Jenkins (Stephen Jean) and the sassy maid Sarah Jane (Tatumn Coraccio) are busy preparing the Manor for a dinner party in honor of Colonel Nigel Covington (Sean Nault) and Lady Miranda Covington’s (Cheri Cooper) friend and famous murder mystery author Edwina Covington (Sierra Trudel). The evening takes an unfortunate turn when the Covingtons’ nosey neighbor, Trevor Barstow (Mikey Dearn), is found dead, having been apparently murdered. Edwina takes it upon herself to investigate, which leads everyone to believe Jenkins, the butler, is the murderer. Jenkins is left with very little time to prove his innocence. Other cast members include Angela Clark as the feisty Gram, Danielle Holt as their adventurous Kat Covington, and Rom Portwood as the Father Timothy. Joe Sawyer has yet again done a great job in the director’s seat alongside with Suzanne Adams as the producer. The cast and crew did an amazing job pulling this production together, leaving everyone on the edge of their seats. During intermission there was a lot of discussion going around the room as to who the audience members thought actually committed the murder. My mother and I having guessed different characters were both wrong, leaving us with the conclusion that we should expect the unexpected. The Gateway Players did a bang up job starting off their 2019 season, and by the looks of their lineup they have a great year ahead of them. They gave the audience a fun filled night which I highly recommend everyone get out to see. Audiences can see just who is to blame in The Butler Did It! 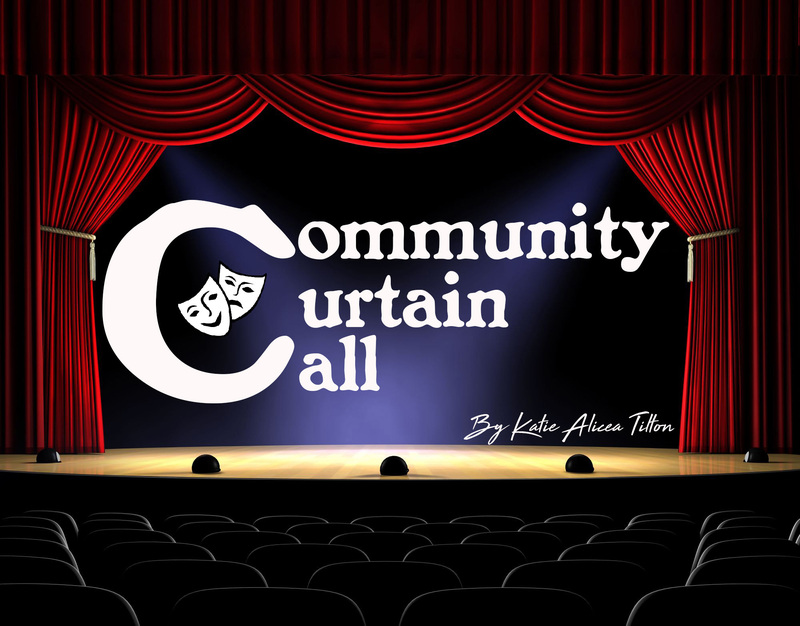 on February 9, 15, and 16 at 7:30 p.m., and February 17 at 2 p.m. at the Elm Street Congregational Church, 61 Elm Street, Southbridge. Parking is available on Elm Street or in the parking deck by the Southbridge Town Hall. Tickets are available at www.brownpapertickets.com or by calling (508) 764-4531. Tickets are $15 for adults and $13 for seniors and youth under the age of 18.